What’s the best way to support people impacted by disasters? To Buy Tickets for the Great East Japan Earthquake and Tsunami Remembrance Event Tomorrow at Wing Luke Museum. An event showcasing the creative works of three critically acclaimed Pacific Northwest artists using the power of film, music, and social media to both honor the victims of the disaster and celebrate the resiliency of the Japanese people. SPECIAL ANNOUNCEMENT: World renown disaster response expert, Gisli Olafsson to speak at Great East Japan Earthquake and Tsunami Remembrance Event. Olafsson is the Emergency Response Director of NetHope and author of “The Crisis Leader,” and is considered as a disaster experts, expert. Gisli has over 15 years of experience in the field of disaster management, and is the Emergency Response Director of NetHope, an organization that uses information communication technology to help humanitarian organizations like the United Nations, International Federation of Red Cross, World Bank, USAID and NATO respond to natural and human-caused disasters. http://youtu.be/c3FmozRenhE Gisli is a member of the UN’s Disaster Assessment and Coordination team, a team of experienced disaster managers that can deploy anywhere in the world on 6-hours notice to coordinate the first response of the international community to disasters on behalf of the UN Office for Coordination of Humanitarian Affairs. Gisli was a team leader for Iceland’s international Urban Search and Rescue team (ICE-SAR) after the Haiti Earthquake in 2010 and has served as part of Iceland’s National Search and Rescue Command. Locally, Gisli was a lead member of King County’s Emergency Operation Centre’s Support team and took part in coordinating over 100 disaster management and SAR incidents. In recent years Gisli has participated in disaster field missions in connections with floods in Ghana (2007), Cyclone Nargis in Myanmar (2008), Hurricane Ike in Texas (2008), Sichuan Earthquake (2008), Pandemic Outbreak (2009), West Sumatra Earthquake (2009), Haiti Earthquake (2010), Japan Earthquake/Tsunami (2011) and Horn of Africa famine (2011). Resolve to be Ready in 2014! ROCKY MOUNTAIN WEATHER GONE WILD! DROUGHTS, WILDFIRES, AND FLOODS, OH MY! Whether you believe in global warming or not, chances are good you or someone you know will have their lives turned upside down by a natural disaster. From super tornadoes in the Great Plains and Midwest, to the lingering impacts of hurricanes in the Gulf and East Coasts, to droughts, wildfires and flash floods from the Redwoods to the Rocky Mountains, millions of Americans have had their lives, livelihoods, and futures turned upside down. Amplifying the effect of these natural disasters is the fact that many American cities and rural towns have grotesquely under-invested in infrastructure and have a backlog of overdue maintenance orders to repair and replace structurally deficient roads, bridges, dams and levees, as well as transmission lines, transportation hubs, rail roads, drinking water systems, along with solid and hazardous waste management facilities. According to a recent American Society of Civil Engineers (ASCE) report, the U.S. received a near failing grade of a D+ on its 2013 annual infrastructure report card. These infrastructure vulnerabilities, combined with major weather-related natural disasters are a malignancy metastasizing into cataclysmic disruptions in communication, transportation, human welfare, and the tragic loss of housing, food, water and energy supplies, and, to a greater extent, cause lasting damage to our national economy. What were once considered issues for a distant future, climate change, urban sprawl, and a deteriorating national infrastructure have moved swiftly, front and center into the present, and Americans are finally beginning to wake up to the changes all around them. Between the wildfires last year and this year, the unprecedented and continuing drought, and the recent rain storms that dumped a year’s worth of rainfall in less than 24-hours, the state of Colorado now sits at the epicenter of a perfect storm of tragic climate events. But considering the 1,000-year rain and 100-year flood event occurred in the backyard of some of the world’s top weather and climate research institutions, we can be confident the event will be thoroughly researched, as both the National Center for Atmospheric Research and the Earth System Research Laboratory are headquartered in Boulder. Ironically, each office was forced to close during to flooding. According the the Colorado Office of Emergency Management, at least eight deaths have been confirmed, with two more missing and presumed dead while dozens remain unaccounted for. Over 11,000 people had be evacuated from their homes, with 700 being rescued by Black Hawk helicopters in what Lt. Col. Mitch Utterback of the Colorado National Guard described as the largest aerial rescue campaign since Hurricane Katrina in 2005. Nearly 19,000 homes have been damaged, and over 1,500 have been destroyed. The Colorado Department of Transportation estimates that at least 30 state highway bridges have been destroyed and an additional 20 are seriously damaged, with repairs for damaged bridges and roads expected to cost many millions of dollars. Miles of freight and passenger rail lines were washed out or submerged, including a section servicing Amtrak‘s iconic California Zephyr. According to the National Climactic Data Center, the globally-averaged temperature for August 2013 tied with 2005 as the fourth warmest August since record keeping began in 1880. August 2013 also marked the 35th consecutive August and 342nd consecutive month with a global temperature above the 20th century average. The U.S. Drought Monitor drought map of Colorado valid September 10, 2013. Kevin Hyde, a post-doc studying post-fire erosion at the University of Wyoming, says “the compounded damages from the cycle of wildfire and flooding could very well be amplified on the Front Range in coming years. Climate models foretell larger regional storms, and scientists have also predicted bigger, more intense wildfires in Colorado’s future.” What is that going to mean for the people living in the mouth of these areas?” wonders Hyde. If the historic droughts, record-breaking wildfires, and the 100-year flood that besieged Colorado this summer, along with the personal tragedies of lives lost and dislocated, hundreds of millions of dollars in infrastructure repair costs, crops lost, communities isolated, water quality problems, and lost revenues to businesses, are any indication of the future living in the Rocky Mountain State — with all its majesty and splendor — people better get ready for the new normal. Hurricane Katrina was a natural disaster that some have described as biblical in scale and unprecedented as a human tragedy. “The Storm,” as the locals call it, was the most destructive natural disaster in American history, laying waste to 90,000 square miles of land, an area the size of the United Kingdom. As the sheer size of Hurricane Katrina became clear, the National Weather Service’s New Orleans/Baton Rouge office issued an ominously worded emergency alert predicting that many areas throughout the Gulf Coast would be “uninhabitable for weeks” after “devastating damage” caused by Katrina. Contraflow lane reversal, voluntary, and mandatory evacuations were issued for coastal Louisiana, Mississippi, and Alabama. Approximately 1.2 million residents of the Gulf Coast heeded the evacuation orders, after hearing the following cryptic message, and fled their homes. After making a brief initial landfall over Southeastern Louisiana, Hurricane Katrina made its final landfall near Louisiana/Mississippi state line, passing over the cities of Bay St. Louis and Waveland, Mississippi. 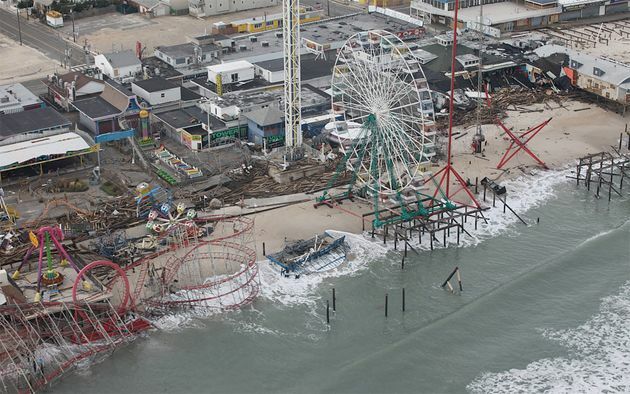 The Storm featured winds in excess of 120 mph and churned up a powerful 27-foot storm surge, which penetrated 6 miles inland, and in some areas up to 12 miles, along bays and rivers; killing close to 300 people and causing billions of dollars in damage to bridges, barges, boats, piers, houses and cars. Thousands were left homeless, destitute, and entombed in mud. Extreme weather photographers Mike Tice and Jim Reed captured harrowing video footage as the storm surge slammed in Gulfport, Mississippi and ripped through their hotel. While the coastal Mississippi communities of Bay St. Louis, Biloxi, D’Iberville, Gulfport, Pass Christian, and Waveland Mississippi where completely washed off the map because of the massive storm surge, New Orleans was overwhelmed by flooding. Homeland Security Secretary Michael Chertoff described the aftermath of Hurricane Katrina as “probably the worst catastrophe, or set of catastrophes,” in the country’s history, referring to the hurricane itself plus the flooding of New Orleans. Katrina’s storm surge caused 53 different levee breaches in greater New Orleans, submerging eighty percent of the city. The levee breaches and the subsequent flooding were responsible for killing over 700 people. Survivors and evacuees reported seeing dead bodies lying in city streets and floating in flooded sections of the city well into October. The advanced state of decomposition of many corpses hindered efforts by coroners to identify many of the dead. In the days following Katrina, residents in New Orleans who “rode out the storm,” resorted to looting stores in search of food, water, and medical supplies. While others took advantage of the situation to loot non-essential items like televisions and tennis shoes. All told, more than 1,833 people died. The results were tragic loss of life and human suffering on a massive scale, and an undermining of confidence in our governments’ ability to plan, prepare for, and respond to national catastrophes. On the 50th Anniversary of the March on Washington, we’d like to honor and acknowledge Presidential Medal of Freedom Recipient, Mr. Bayard Rustin, the man behind the man, the man behind the march, and the man behind the movement. Who Is Mr. Bayard Rustin You Ask? To learn more about the life and times for Bayard Rustin, please check out the award winning feature documentary film BROTHER OUTSIDER. How toxic is the oil dispersant Corexit when mixed with oil? In the wake of the BP Deepwater Horizon Oil Catastrophe and the subsequent use of 2 million gallons of the oil dispersant Corexit to disperse an estimated 250-300 million gallons of oil, we find ourselves asking this question almost everyday. Three and a half years after the largest human-caused environmental disaster in history, remediation and restoration efforts have helped to remove the most obvious signs of the disaster and returned the most affected coastal communities to near pre-spill conditions. But Gulf Coast residents now face an even more ominous health care crisis, as untold numbers of people – cleanup workers, divers, beach comers, residents, children, etc. – have been made ill from exposure to a mix of oil, methane, Corexit, and from inhaling aerosolized oil fumes from the in-situ oil burns (oil burned in contained areas on the surface of the water). Since 2010, the Storm Surge team has interviewed scores of people who claim to suffer from acute illnesses ranging from rashes, upper respiratory infections, severe asthma, skin infections, blisters in between their fingers and arms on their legs and their feet, and blood in their urine, to heart palpitations, kidney and liver damage, migraines, memory loss and reduced IQ, after they came into contact with oil and Corexit. We continue to remain perplexed as to the reasons why the American mainstream media fails to cover this problem. Last week, 60 Minutes Australia published the following two-part investigative report on the use of Corexit to disperse oil, both here in the United States and in Australia. Meanwhile, BP is reportedly spending over $5 million a week on a nation-wide marketing, advertising, and public relations campaign to convince people across the country that the Gulf of Mexico is safe to swim in, the seafood is safe to eat, the environment is being restored to pristine order, and how great a company BP is to work for. The government board charged with protecting New Orleans from flooding sued the oil and gas industry on Wednesday. The suit would require oil, gas and pipeline companies restore damaged wetlands and pay damages for the effects of the lost wetlands on levees. But Louisiana Gov. Bobby Jindal, who appointed the flood protection board, has a different demand. He ordered the board to drop its lawsuit and fire its lawyers. A group of economic and polar scientists warn that the rapidly thawing Arctic and the subsequent release of methane gas into the atmosphere has the potential to trigger a catastrophic “economic timebomb” which would cost trillions of dollars and undermine the global financial system. Meanwhile, billions of people across the planet continue to keep their heads in the sand, deny that climate change is happening, or are to apathetic to care. 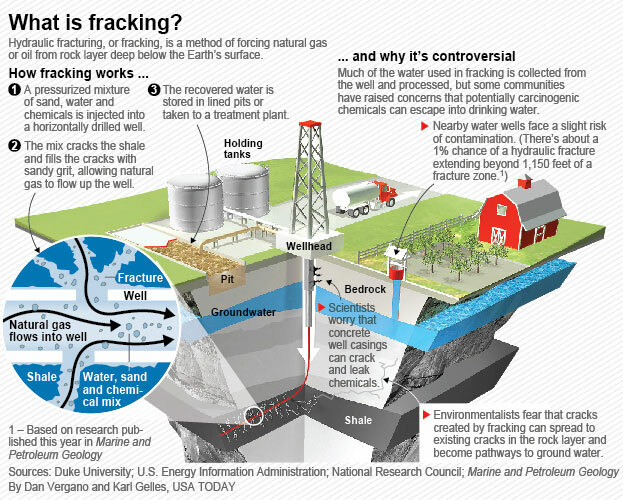 A former oil and gas executive speaks out on fracking and climate change. A new study by Kerry Emanuel, a hurricane researcher at MIT, finds that tropical cyclones are likely to become both stronger and more frequent in the years to come, especially in the western North Pacific and the North Atlantic. Emanuel’s study, published Monday in the Proceedings of the National Academy of Sciences, uses the latest generation of global climate models to power a series of high-resolution, regional simulations of tropical cyclones around the world. According to National Oceanic and Atmospheric Administration, 2012 was the second-most expensive year for natural disasters, claiming over 300 lives and costing more than $110 billion in damages. Long-term, independent records from weather stations, satellites, ocean buoys, tide gauges, and many other data sources all confirm the fact that our nation, like the rest of the world, is warming, precipitation patterns are changing, sea level is rising, and some types of extreme weather events are increasing. What’s so scary about this, it’s going to get a heck of a lot worse, before it gets better. On Tuesday, President Obama delivered remarks at Georgetown University, laying out his bold vision for a comprehensive plan to reduce carbon pollution, prepare our country for the impacts of climate change, and lead the international effort to address global climate change. The impacts of climate change, including severe weather, threats to public health, and our food system are affecting our economy, our communities, and our national security. In 2012, the cost of weather related disasters exceeded $110 billion in the United States, and climate change will only increase the frequency and intensity of these events. Since 2010, my team, working under the auspice of documentary filmmakers, have witnessed many of our Nation’s disasters up close and personal. From the devastating and deadly effects of the BP oil catastrophe, to Tropical Storm Lee and Hurricane’s Isaac and Sandy, to massive tornado storms in the Great Plains, Midwest and Deep South, to wildfires in California and Colorado, and the lingering effects of blistering heat waves and drought throughout the country. Our film, Storm Surge affirms the tragic reality that our addiction to fossil fuels and the production of CO2 are compromising everything we value as Americans — our environment, our economy and our political system — and the resulting changes in our climate will put everything we’ve accomplished as a nation into jeopardy. Climate driven severe weather is not just a problem for the residents of the Gulf Coast, Great Plains, Midwest, or the East Coast, but for all of us. We are doing our part to help our fellow Americans adapt to climate change, as well as build healthier, safer, and more resilient communities through the power of narrative storytelling and social impact media. We are heeding the President’s call to take action. Storm Surge Films is seeking an enthusiastic individual for a documentary Research & Production Internship for the summer 2013. The internship program at Storm Surge Films is a unique opportunity for young and emerging filmmakers to learn about producing innovative documentary films alongside other passionate storytellers. Interns will find numerous opportunities to build relationships and learn from those working in documentary, arts and non-profit communities throughout the US and beyond. Internships are ideal for candidates who bring strong individual creative sensibilities combined with an interest in participating in a highly-collaborative environment where a diversity of ideas are respected and embraced. Self-motivated individuals with a strong entrepreneurial spirit, interested in learning about documentary films, media education and community-based outreach and engagement are encouraged to apply. S/he will work closely with the studio’s director, producer and other interns on a daily basis. As SSF projects commonly involve the creative participation of community members typically experiencing filmmaking for the first time, it is highly desirable if candidates demonstrate an interest in education and community engagement. S/he will work closely with the studio’s director, producer and other interns on a daily basis in a highly collaborative environment where ideas are respected and embraced. Storm Surge Films’ is headquartered in Seattle, with field locations in Bay St. Louis, MS, Joplin, MO, Tuscaloosa, AL, and New York City. Storm Surge Films is committed to a diverse workplace and is an enthusiastic equal opportunity employer. Dependent upon execution and performance over a multiple month time frame, this position has the potential to become a paid part-time job. NASA scientists report disturbing bursts of methane being emitted from the tundra as the spring thaw progressed northward over Alaska’s North Slope. Just days after Superstorm Sandy slammed into the East Cost, killing 72 and causing over $50 billion in damage, the Storm Surge production team met up with members of Occupy Sandy to see firsthand how volunteers mobilized to help with the recovery and rebuilding efforts. Tomorrow, June 14th, the group will host a debriefing meeting to discuss what went right, what went wrong, and identify recommendations for those who get involved in grassroots disaster relief in the future. As a lead up to the event, Occupy Sandy released this short video to raise awareness. If you can’t make it to NYC and want to participate remotely you can watch the livestream at http://new.livestream.com/accounts/4360121/events/2171140. 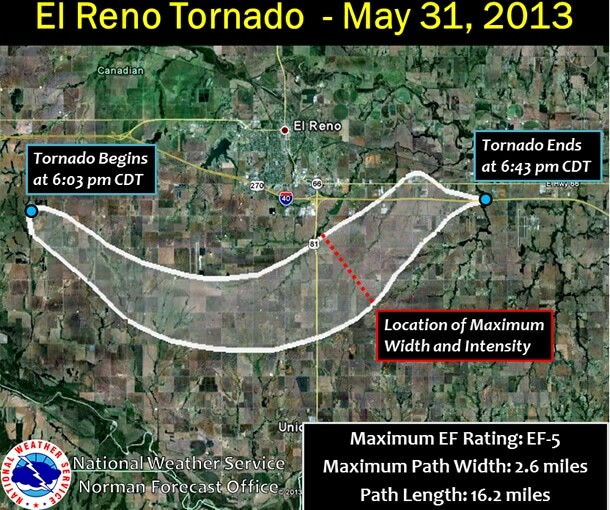 The tornado that struck El Reno Oklahoma on May 31st has now been classified as an EF-5. A DOW (Doppler On Wheels) truck recorded a wind speed of 296 MPH and the tornado was 2.6 miles wide making this the largest tornado ever recorded in modern history. The path of the tornado was 16 miles long and it was on the ground for 40 minutes. The tornado grew from 1 mile wide to 2.6 miles wide in 30 seconds. The previous widest tornado record was the F4-rated (on the 0-5 scale) Wilber – Hallam, Nebraska twister that touched down on May 22, 2004. It had a maximum width of 2.5 miles. We’re quick in this country to obsessively focus on the “disaster of the moment” while forgetting about the disasters of yesterday and of yesteryear. The FEMA App contains preparedness information for different types of disasters, an interactive checklist for emergency kits, a section to plan emergency meeting locations, information on how to stay safe and recover after a disaster, a map with FEMA Disaster Recovery Center locations (one-stop centers where disaster survivors can access key relief services) and Shelters, general ways the public can get involved before and after a disaster, and the FEMA blog. The greatest potential for loss of life related to a hurricane is from the storm surge! Storm surge is simply water that is pushed toward the shore by the force of the winds swirling around the storm. This advancing surge combines with the normal tides to create the hurricane storm tide, which can increase the mean water level to heights impacting roads, homes and other critical infrastructure. In addition, wind driven waves are superimposed on the storm tide. This rise in water level can cause severe flooding in coastal areas, particularly when the storm tide coincides with the normal high tides. Hurricane Specialist, Bryan Norcoss, from the Weather Channel, explains the science behind a storm surge in the days leading up to Hurricane Isaac in August 2012. Because much of the United States’ densely populated Atlantic and Gulf Coast coastlines lie less than 10 feet above mean sea level, the danger from storm tides is tremendous. Will Tornadoes Get Worse As Earth’s Climate Heats Up? On May 20, 2013, a devastating EF5 tornado shredded the city of Moore, Oklahoma, killing 24 deaths and destroying an estimated $3B in property. It was the third time a tornado has stuck the city in 14 years. Why was 2011—the worst ever recorded tornado season that left hundreds dead in Joplin and Tuscaloosa—followed by the quietest ever year of activity prior to the Moore disaster? Can improved radar and warning technology explain why so many fewer died in Moore than in Joplin? 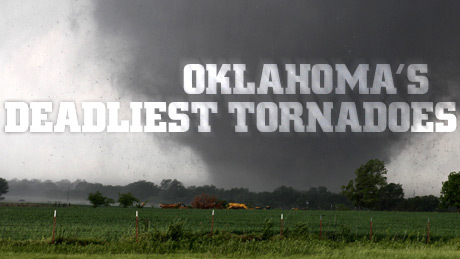 And will tornadoes get worse as Earth’s climate heats up? Like a jet engine, with a train behind it. On May 27, 2013, near Salinas, KS, Brandon Ivey and Sean Casey capture this amazing video from inside a massive wedge tornado. Just one week after a devastating tornado storm rips through Norman and Moore, OK, killing 24 and causing an estimated $2B in property damage, US cities now face another natural hazard, hurricanes. June 1st is the official start of the 6-month hurricane season. For 2013, NOAA’s Atlantic Hurricane Season Outlook suggests a 70% likelihood of 13 to 20 named storms (winds of 39 mph or higher), of which 7 to 11 could become hurricanes (winds of 74 mph or higher), including 3 to 6 major hurricanes (Category 3, 4 or 5; winds of 111 mph or higher). Hurricanes can cause catastrophic damage to coastlines and several hundred miles inland. Hurricanes can produce winds exceeding 155 miles per hour as well as tornadoes and mircrobursts. Additionally, hurricanes can create storm surges along the coast and cause extensive damage from heavy rainfall. Floods and flying debris from the excessive winds are often the deadly and destructive results of these weather events. “As we saw first-hand with Sandy, it’s important to remember that tropical storm and hurricane impacts are not limited to the coastline. Strong winds, torrential rain, flooding, and tornadoes often threaten inland areas far from where the storm first makes landfall,” said Kathryn Sullivan, Ph.D., NOAA acting administrator. Slow moving hurricanes that churn through mountainous regions tend to produce especially heavy rain and can trigger, flash floods, landslides. or mud slides. Individuals who live in communities at high risk of being affected by a hurricane should consider flood insurance protection. Flood insurance is the only way to financially protect your property or business from flood damage. To learn more about your flooding risk and how to protect yourself and your business, visit the Federal Insurance and Mitigation Administration (NFIP) Web site, www.floodsmart.gov or call 1-800-427-2419. To learn more about how you can prepare for hurricane season, visit www.ready.gov/hurricanes. Today, the Obama Administration released the draft of its 2017-2022 plan for offshore drilling, known as the Outer Continental Shelf Oil and Gas Leasing Program. The plan proposes to prohibit drilling in the Atlantic Ocean but offers 13 new potential lease sales – 10 sales in the Gulf of Mexico, which is still healing from the disastrous BP oil spill, and three sales in the sensitive Arctic waters off the coast of Alaska. One morning in March of last year, I set out from Gulfport, Mississippi, on a three-week mission aboard the U.S. Navy research vessel Atlantis. The 274-foot ship, painted a crisp white and blue, stood tall in the bright sunlight. On its decks were winches, cranes, seafloor-mapping sonar, a machine shop, and five laboratories. Stowed in an alcove astern was Alvin, the federal government’s only manned research submarine. “Research vessel Atlantis outbound,” A. D. Colburn, the ship’s captain, reported into the ship radio. #POTUS announces key Executive actions to address climate change. On Friday, President Obama plans to announce a sweeping package of commitments — over 300 in total — from companies and government agencies to increase the deployment of solar panels, and make buildings more energy efficient. The announcements will take place at a Walmart(s WMT) in Mountain View, California. While the commitments are a far cry from the kind of financing that the green stimulus provided, the announcements are the latest way for Obama to highlight his attention to environmentalism, clean energy and climate change. Earlier this week, he released the massive climate change report. On Tuesday, March 25, 2014, we deployed to the Oso, Washington Landslide to document the disaster response and recovery life cycle from end to end. On our second day in the field, we were granted permission to venture into the 1500 foot wide primordial debris zone to witness the brave men, women, and K9 units search for victims buried under tons of mud, rocks, trees, and household materials. As we were making preparations to enter the slide, a women named Mary K volunteered and we accepted her offer to help take photos and shoot video inside the debris zone. Mary lost a close friend in the slide, so this was an opportunity to help honor and bring closure to her loss. Up Close and personal at the #530Slide debris field.